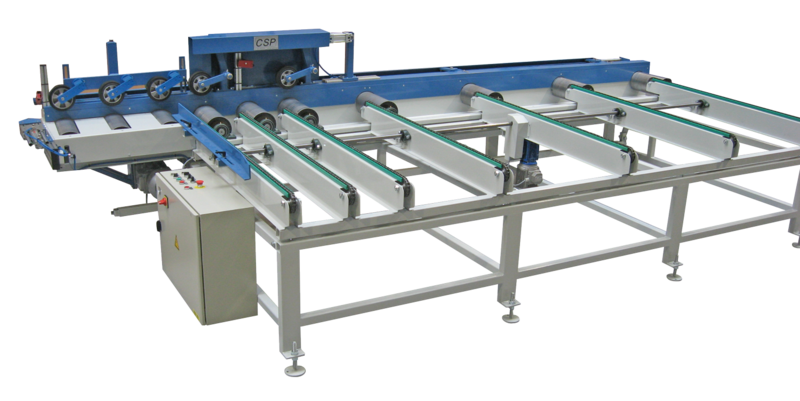 PAR-Feed® is a semi-automatic feeding system for planing and molding work that is easy to set and that can shift quickly between production runs. With PAR-Feed® the operator has time to evaluate the wooden work pieces. Manipulating planks becomes more user friendly and as such decreases the workload. PAR-Feed® consists of robust feedingrolls with stepless speed adjustments and pneumatic driven pushing rollers. PAR-Feed® is provided with cross chains that have 3 control modes and suited for all type of work. PAR-Feed® can be delivered with in the hight adjustable feedingrolls and conductors above the chain field. The feeding system can be equipped with bearing support at the input or a hydrolic scissor lift for optimal ergonomics. A chain buffer for 1 or 2 packs can be integrated. Of course other product measurements are possible.